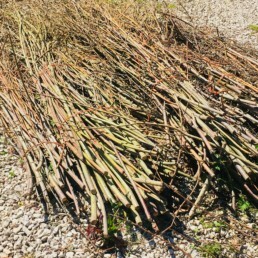 Today, and this evening, I have been mostly stripping willow. I stripped willow until an incredible full moon came up in the sky – it’s easy to get carried away, willow stripping is quite therapeutic and it is really nice to be working outside again, I miss the physicality of making (reminder to self!). The willow is from Morland School, which is where it will return once our creative processing has taken place. Jenny Brook (co-director of The Studio Morland), Gemma Webb (of Wellnatured Outdoors) and myself will be producing our second Art Week at Morland School in June, exploring, celebrating and making work around habitats and the insects that live in our local. The willow will be transformed into insect lanterns creating a swarm of hopefully 100 plus insects created by the children and the community, and paraded through the village and along the river making a temporary trail. We’ll then exhibit the lanterns at The Studio Morland for the summer. It’s a fun project – the kids at Morland and the school are great to work with, it will involve as much of the local community that wants to be involved, it’s all about celebration and learning, and it’s hands on, and I like that.